We use WhatsApp to communicate with our friends, family, workgroup and other people. Some of the messages that we share can have sensitive information which should not be viewed by anyone. We may also want to keep the content of a conversation private and hide chat in WhatsApp for the same reason. No matter what the reason, you wouldn’t want to keep all the messages showing up on your WhatsApp chat window. Thankfully, you can just hide or unhide them as you need. Many people look up how to hide WhatsApp chat and today we are going to show you how. We will discuss three different ways to hide WhatsApp conversation so that your messages remain private. Here is a look at a few of the ways you can easily hide your WhatsApp messages. The methods are simple, and can help you get rid of unwanted messages from the screen that you do not want to delete. 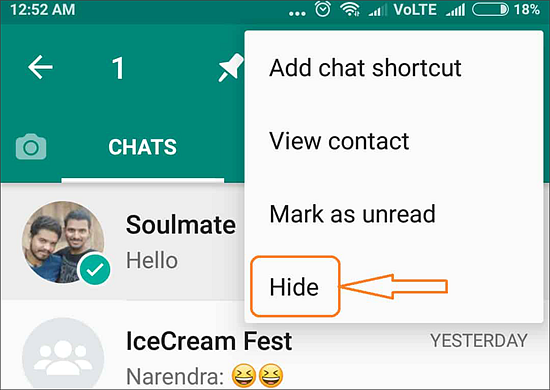 This is a default method you can use to hide WhatsApp messages. Archiving a chat hides it from the chat screen and you can access it later. It can also be done for better organization of your individual or group chats. 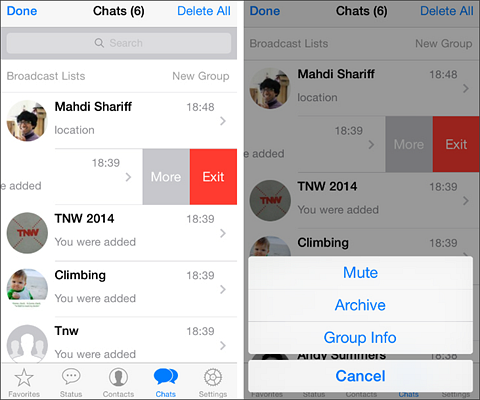 To select the chat you want to archive, tap and hold it on the Chats interface. Now tap on the Archive icon which appears on the top bar. You have now successfully archived the chat and hidden it from the Chat interface. Work your way down to the bottom of the Chat interface. Tap and select Archived Chats at the bottom. Now select and tap on the chat that you wish to unarchive. Find the Unarchive on the top bar and tap on it. You can now find the specific chat on the Chat interface. 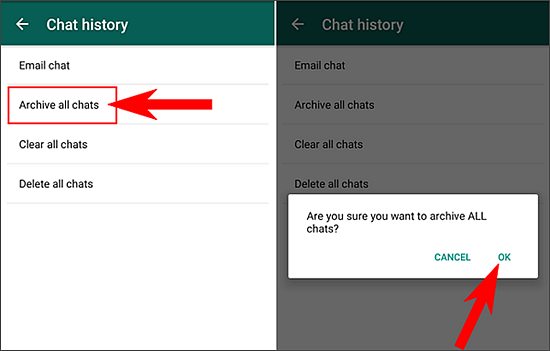 Note: The Archive Chat feature will not delete any conversation or create backup on your SD card. Go to Settings by tapping on the Menu button in the main Chat interface. Select Chat and then tap on Chat History and choose Archive all chats. Note: You will be able to see Archived chats when a new message is sent by the conversation. The same method can be used to hide WhatsApp Chat on your iPhone. Just follow the instructions below. You also have the freedom to archive all chats simultaneously on your iPhone. Go to WhatsApp Settings and select Chats. Then tap on Archive All Chats. Go to the Chats tab and make your way to the top. Then pull down the screen. You will be able to view archived chats once a new message comes in the conversation. A chat can also be unarchived by looking up the contact name or message from the person. Access the Archived Chat interface. Choose a chat and slide your finger over it in a right to left motion. Access the search bar on top of the Chats tab. 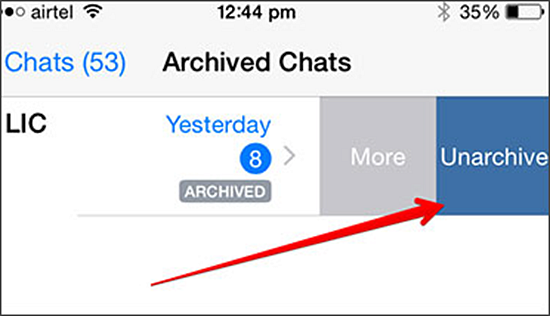 Enter the name of chat or part of message for the chat you want to unarchive. Wipe your finger over the chat from right to left. Note: Your messages won’t be deleted or backed up on iCloud while archiving. The Archive option is only supported by iOS 7 and later versions. GB WhatsApp is an advanced version of WhatsApp which also lets you enjoy other cool features not available in the original app. The app is available completely for free and you can install it without the need to root your phone. It is safe and works perfectly out of the box. 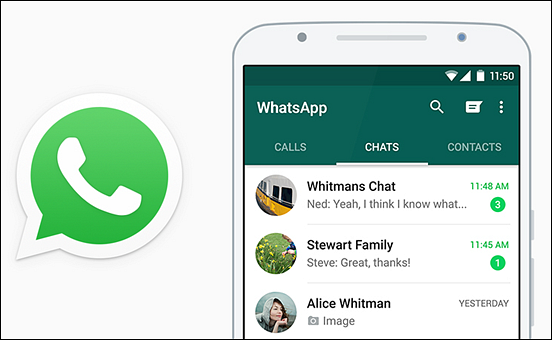 You can download GB WhatsApp on your phone and get hold of multiple cool features. 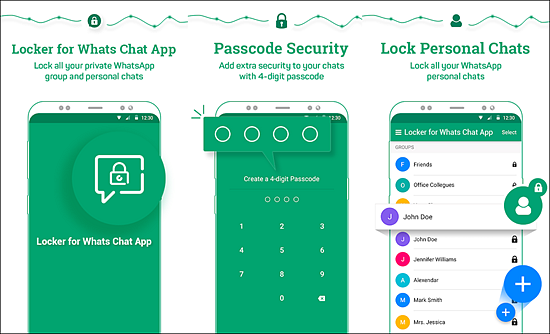 The features help you keep your chats safe and hide WhatsApp chats. With the help of the app you can even recall and delete the messages you have sent to your contacts. Moreover, you can run two WhatsApp accounts in on phone easily. You can see and hide status privacy and save them for later. The app comes with an in-built feature to hide WhatsApp chats and conversations. You can even hide other components such as last seen, second tick and blue ticks. You are also able to hide the ‘typing a message’ status while entering your messages. The app can be downloaded and installed along with the original WhatsApp version. There are no worries of conflict and you also won’t be banned from WhatsApp. Download the application and allow unknown sources to be activated on your phone. You can access the phone Settings and go to Security to allow unknown sources. Locate the apk with your file explorer and install it just like any other messenger app. You will have to enter and verify your number after the app is installed. You can receive the OTP via sms or phone call. Now you can start using the app after the verification. You can use the app and choose chats to hide them from the main chat menu. This is another easy and simple method to hide WhatsApp conversation and chats. Using the app you can secure your WhatsApp and the messages using an unique pin. You can lock both individual and group chats and keep them safe from prying hands and eyes! The app is completely free to use and one of the best ways to hide your WhatsApp chats. It has a user-friendly interface and requires few permissions to be installed on your phone. Find the icon of the app and tap on it to launch the application. You have to create a PIN for locking the chats and the WhatsApp app. It is the same PIN and you have to enter digits and confirm your selection. Set a recovery email address so that you can recover your PIN in case you forget it. Grant the permissions asked by the app to run it. Open the app and select the ‘+’ icon to select the chats you want to hide. Keep messages safe from the prying eyes of everyone else. 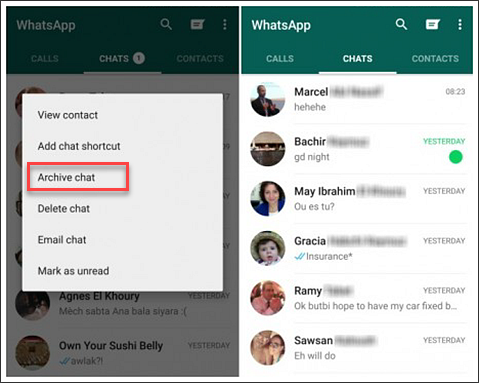 We have given you 3 different ways to hide WhatsApp chat and messages. No longer will you need to worry about someone discovering your private messages or any personal information that you don’t want to share. The methods can be used for both Android and iPhone and help you protect your privacy. That is all that you need to do to ensure that you can hide or unhide messages as you want. As you saw, it is simple and all you need is a few clicks to help you get started. Have you accidentally deleted or lost some important WhatsApp messages? Want to retrieve them quickly but no backups are available? Do not worry! Here we recommend Gihosoft Free Android Data Recovery Software for you. With it, you can easily recover deleted WhatsApp messages even without a backup. Click on the button below to try it out!